Is the heat index accurate? You probably know this feeling: the thermometer shows a moderate temperature, but once you leave the house, the heat becomes too much to bear. Why does the apparent temperature differ so much from the real one? It is because the heat index today is particularly high. Our heat index calculator can tell you, how high exactly. Read on to discover what is the heat index and how to calculate it. Also, give the wind chill calculator a try. Heat index, or the humidex, is the "felt air temperature". It takes into account both the air temperature and its humidity, describing how hot it really feels. Moist air feels hotter, because it hinders the sweat evaporation - our natural cooling mechanism. It is worth noting that the heat index considers the relative humidity in shaded areas. Hence, the heat index in full sunlight can be even higher than the one specified by the heat index calculator. 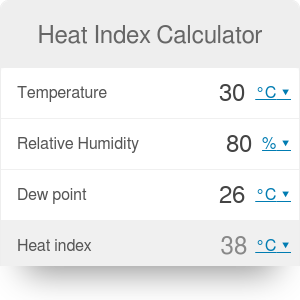 Our calculator can determine the heat index basing on temperature and either the relative humidity or dew point. You can check out the dew point calculator for further information on these parameters. Measure the temperature outside. We can assume it's as high as 95°F. Determine the relative humidity or the dew point. In this example, we will assume relative humidity of 75%. Type these values into the heat index calculator. The heat index today is almost 128°F. Oof! You might be surprised, but not really. The heat index was invented by R.G Steadman and took into consideration about 20 factors. For example, they included the speed of walking, a person's height and weight, but also the speed of wind, latitude (and hence the angle of sun's rays), or even pressure decrease resulting from altitude. When the heat index formula was simplified to depend on two parameters only, all of these factors were assumed to be constant. If you walk faster than 1.4 m/s, or you are hiking high in the mountains, your perceived temperature might differ from the one indicated by our calculator. Nevertheless, it's accurate enough to let you know when the weather conditions are bad enough to cause a heatstroke. Heat Index Calculator can be embedded on your website to enrich the content you wrote and make it easier for your visitors to understand your message.